EcoSocialist I identify as an Ecosocialist. Would love to connect with others that are as well. I am an anarchist-syndicalist. My interests include: leftist politics, artificial intelligence, Transhumanism, science fiction, nihilism, and roleplaying games. I hate identity politics. Does hydrogen3 belong in this group? Equality is the goal We are all human and there is nothing that makes one person any better than another. 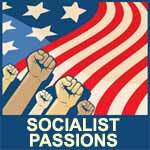 I have read a bit on socialism and always find something to love about it. I respect the working class over the "high and mighty". Common people are what makes the world great. We are the workers and we create humanity, civilization, and brotherhood.